Two day in a row! 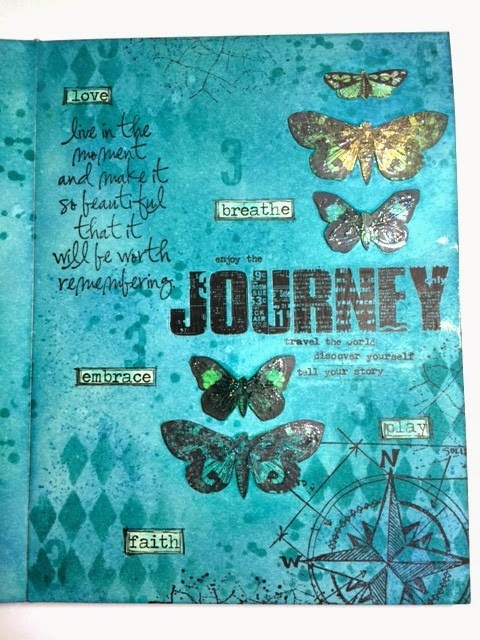 I have been on an art journal kick. Loving be able to just express whatever is on my mind. 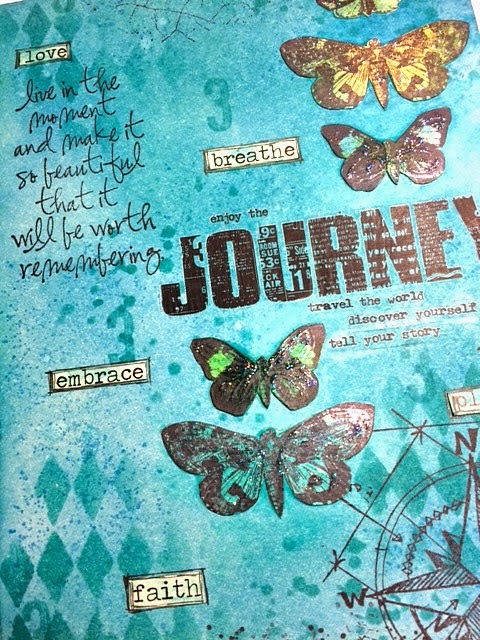 I am using my Inky Art Journal to create in. It is 6x8. I love this size...very portable as well. I started by blending Broken China, Salty Ocean and Peacock Feathers all over that pages. While your inking your background the book lies perfectly flat when open. It's awesome for blending both pages at the same time...barely a seam. Anyway after the colors were the way I wanted them I took a the Harlequin and splatter stencil from Tim and blended more Peacock feather over the stencil. I was surprised by how well they appeared. Love being able to do monochromatic coloring and Distress Inks are the perfect ink for that. Next I pulled out some of Tim's rubbings and added those. Butterflies had to make an appearance to I stamped those on a tag, blended Distress Ink and then "fussy" cut them out. Adhered them using Multi Matte...this stuff is amazing. Once it is applied you can still work over it and it is invisible to the eye. Next, I stamped a sentiment and some crackle around the page. Printed some words out on Manila Paper with my printer, inked them, adhered them and then outlined them. The last touch was a bit of Stardust stickles to the butterfly wings. I did the same thing to the page next to this one as far as the background is concerned. A place where I can go back and write some thoughts and feelings down. I really think I am going to love being able to keep these "truths" in one place. I have started many art journals and they are all works in progress..but this one has a specific meaning for me. How many art journals are you working in right now? I cannot imagine just having one, wink. Happy day! Hope to see you back here soon! If you would like to find the supplies used visit Inspiration Emporium here. If you use the code "inkgirl" you will get a 10% discount off your order! You can always wrap them and put them under the tree from Santa, hehehe. And if your local stop by She Scrapbooks to find what your looking for! Love the colors and layers. Miss you and congratulations on your stamps!!!! This is beautiful. I've just started my first art journal :). Quick question - when you adhered the butterflies were you able to apply the Multi Matte overtop without affecting the ink?